[SatNews] The U.S. Air Force has taken operational control of a space test satellite built by Ball Aerospace & Technologies Corp., the company reports. Artistic rendition of the STPSat-3. Image courtesy of Ball Aerospace. The satellite, designated STPSat-3, was launched from Wallops Flight Center in Virginia in November as part of the Operationally Responsive Space-3 mission, and the Air Force will now perform the satellite's technology demonstration mission. The spacecraft, built by Ball in just 47 days, is about the size of a small refrigerator. It carries five demonstration technology payloads and a de-orbit payload for the U.S. Department of Defense, NASA and the National Oceanic and Atmospheric Administration. "We designed the SIV architecture [standard interface vehicle] to reduce the cost and time required to access space while maximizing the opportunities for suitable payloads," said Dave Kaufman, vice president and general manager of Ball's National Defense business unit. 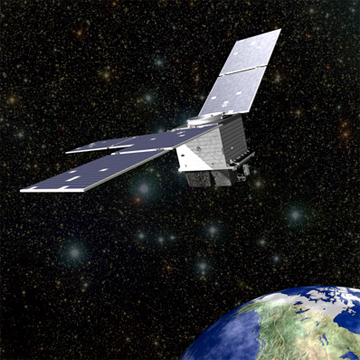 "STPSat-3's predecessor, STPSat-2, just passed its three-year anniversary on orbit and has proven the robustness of the SIV design." Ball designed the SIV satellites to accelerate Department of Defense space technology demonstrations. More information is available at this direct link.